The bacon, lettuce and avocado sandwich. Anyone can make a grilled cheese sandwich. All you need is bread, cheese, and a panini press, and something pretty good happens. To increase the quality of that sandwich to the stratosphere, combine homemade bread, top-quality cheese, and some skill with a skillet (forget the press). At Rifrullo Cafe in Brookline Village, owner Colleen Marnell-Suhanosky’s grilled cheese ($5.50) is made on the house bread, which is light and airy, the crust so crisp it’s a revelation, and the cheddar inside, pan-toasted under a brick, melts into that hole-y crumb to define what this sandwich should be. When Taleggio becomes the main event, and braised greens and caramelized onions enter the mix ($8), you get a sandwich that makes you shake your head in wonder. Marnell-Suhanosky and her bright Rifrullo (the name, pronounced ree-froo-lo, means “social hub” in Florentine dialect) is an enchanting spot that you might find in a hip Brooklyn, N.Y., neighborhood. 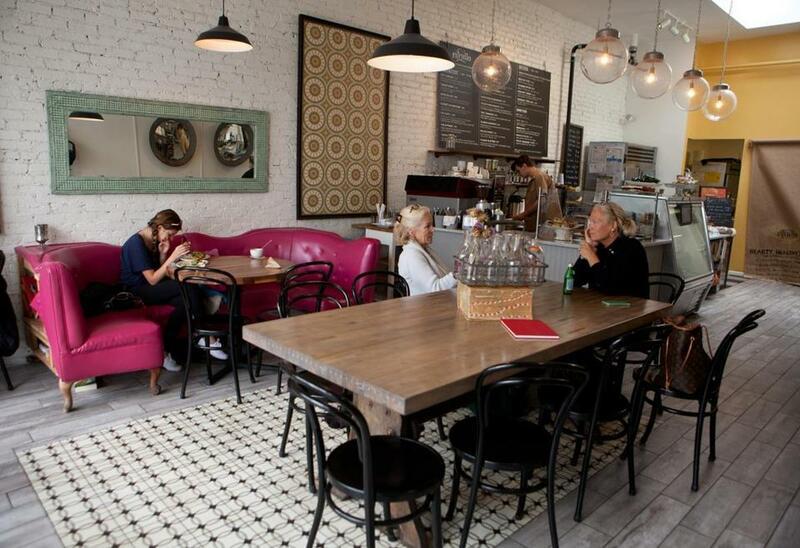 It opened in 2013, in the former Sealey’s Lunch space. 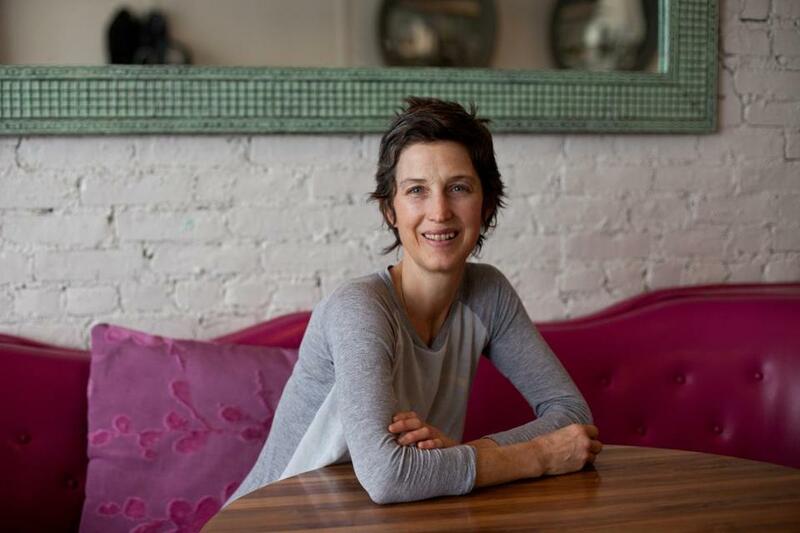 Marnell-Suhanosky, who trained at the Culinary Institute of America, began her career at Biba under Lydia Shire, lived in Florence, where she cooked with a variety of chefs, baked with Gramercy Tavern pastry chef Claudia Fleming, and opened Sfoglia restaurant with her ex-husband, Ron Suhanosky, on Nantucket in 2000, and on Manhattan’s Upper East Side in 2006. Today, Marnell-Suhanosky, a mother of three, cooks with Salvadoran native Bobby Mendoza, who has been working with her for more than a dozen years. At Rifrullo, the food aesthetic is far more sophisticated than the spot, which looks like a haphazard collection of furniture but comes together as a place you want to settle in and never leave. A large hot-pink leatherette couch came from her grandparents’ Italian-American restaurant in Minneapolis (it was her grandmother’s favorite color). In this cafe, an opening on the side of the couch holds books. A communal table beside it seats eight, a few more tables are next to tall storefront windows, and a counter, made from rough-hewn Cypress wood, holds a few bar stools under big rusted, steel-framed round mirrors. Table decorations might be an outsized wood bowl of red onions. You order at a counter and if you stay to eat, food comes on old Buffalo diner china. Breakfast selections are made until 11 a.m., lunch is all day, dinner offered from 5 to 8 p.m. Once a month the restaurant hosts a community prix-fixe menu. Understated, beautifully made pastries rotate, such as tiny brownie squares ($3.50 for a package) or hazelnut shortbread ($1.50 each). Mendoza is making the daily soups, which include chicken ($7.50), with big chunks of shredded meat, potatoes, carrots, peas, and celery, in a lemon-scented broth. Another day, a lightly spicy, thick, three-bean chili ($7.50), with morsels of chicken, tastes like it might have simmered for days. Quinoa-taco salad ($9.50) comes with chickpeas, shredded carrots, avocado, small bits of soft cheese, and chicory, drizzled with cumin vinaigrette. Most sandwiches are made on the house bread or on deliciously crusty sourdough rolls. The Cypress ($8) comes on warm brioche with an egg, avocado, cheddar, kale pesto, and bacon. You might think about inhaling this beauty. 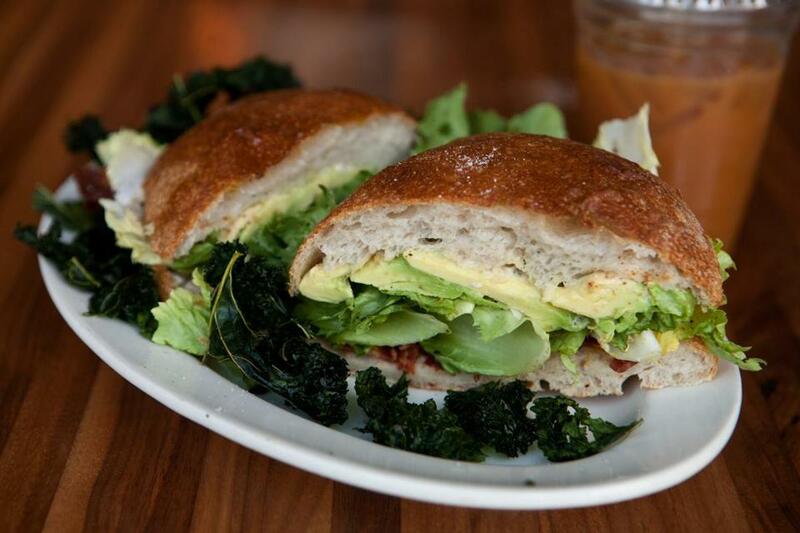 BLA sandwich ($8.50) combines ripe avocado, caramelized bacon, and lettuce, and is accompanied by a few kale chips. An Italian tuna sandwich ($8), like the Provencal pan bagnat, is layered with pickled vegetables, chicory, and hard-cooked eggs in a big roll. 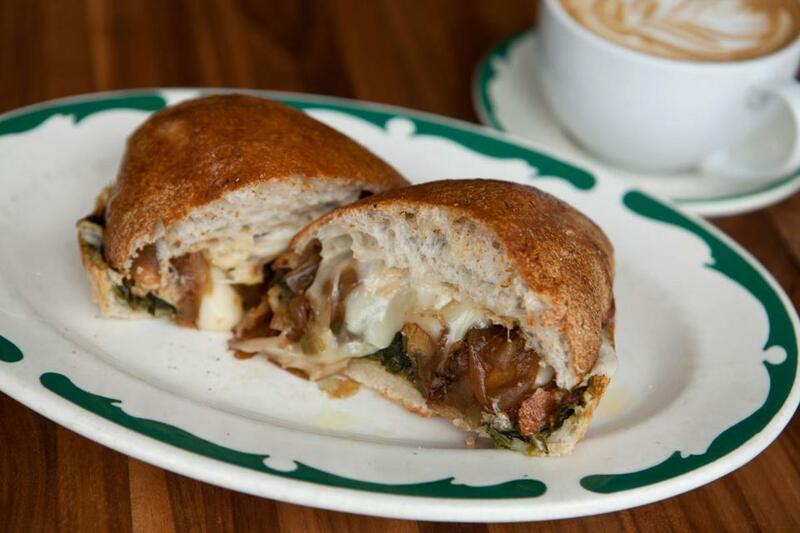 The grilled telaggio cheese, caramelized onions, and braised greens. Dinners like spatchcock chicken ($10 half, $20 whole) are deliciously lemony, with a spinach, almond, and caramelized onion salad. Eggplant tagine ($12) with lemon-olive pesto and chickpeas, is drizzled with the house yogurt, which Marnell-Suhanosky and Mendoza have been making for many years. One Saturday night at a community dinner ($25 each) — the restaurant has 18 seats, so this is one of the most coveted pop-ups in the area — a big plate of the house bread appears with a saucer of olive oil, these served by two children, a girl and boy dressed as waiters who could star in a film. A gorgeous salad has chicory, pea greens from Allandale Farm, all manner of other greens, and pieces of cheddar-cornmeal crackers. The main course is feathery light, lemony, brown-butter gnocchi with pea greens. Dessert is gelato of house yogurt and fresh mango, accompanied by chocolate shortbread. Every bite on every plate is perfectly prepared and every seat in the house is taken. The delight in the room is palpable. For some years, my husband and I toyed with the idea of opening a small restaurant. On long car rides we would plan everything, down to the detailed dishes we would serve (one prix-fixe menu only each night). It would be a small, friendly, neighborhood place populated by diners eating on tables and chairs that were begged and borrowed. The name would be Mam’zelle because my training was in France and that food is my first love. We’re never opening Mam’zelle. But Colleen Marnell-Suhanosky, you are living out our dream. And beautifully, I might add. 147 Cypress St., Brookline Village, 617-505-6727, All major credit cards. Wheelchair accessible.www.rifrullocafe.com. Prices Breakfast $5-$9 (served until 11 a.m.). Lunch $5.50-$10. Dinner entrees $12-$14 (served 5-8 p.m.) Monthly community dinners on Saturdays around $25. Hours Mon-Fri 8 a.m.-8 p.m., Sat 8 a.m.-6 p.m., Sun 10 a.m.-4 p.m.
What to order The Cypress breakfast sandwich (served all day), quinoa-taco salad, Italian tuna sandwich, BLA sandwich, Taleggio sandwich, grilled cheese.